Juan-Les-Pin, France, 18 September 2018: “In the age of the smartphone, the construction industry is still in the era of the Walkman” declared EVIA Steering Committee member, Yves Lambert, on the occasion of his key note address at the declared at the 39th AIVC Conference. 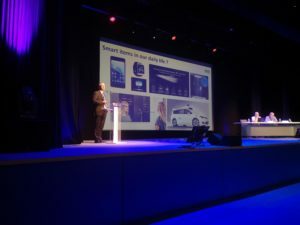 Mr. Lambert’s speech, delivered to an audience of over two hundred researchers and industrialists gathered on the French Riviera, focused on the potential benefits that could be realised via the integration of smart solutions into ventilation products, particularly for Indoor Air Quality (IAQ). “Today’s advantages of smartness are mainly focused on energy efficiency, which is important, but only a baseline expectation. The focus now should be additionally more human (wellness) because that impacts productivity for employees and well-being at home. A building that thinks for itself and adapts to suit the occupants is the new challenge”. Despite the potential of smartness to deliver energy efficiency and Indoor Air Quality improvements Mr. Lambert shed light on the barriers that could hinder the uptake of smart ventilation technologies not least from a regulatory perspective. At the EU level the European Commission’s flagship Smart Readiness Indicator (SRI), that is being developed under the Energy Performance in Buildings Directive (EPBD), currently only references health aspects as a boundary condition and gives insufficient weighting ventilation’s role in the built environment. Further, the preparatory study to regulate smart appliances under the Ecodesign Directive, which suggests introducing a smart icon on the product energy label, currently excludes residential ventilation from the scope. The plethora of definitions for available for ‘smartness’ itself, wide variations in the estimations of the potential benefits of ‘smartness’ for ventilation products and uncertainty over the parameters of smart ventilation functionalities also combine to delay the transition. EVIA’s Connectivity Working Group is plugging the ventilation industry’s voice into the smartness debate and is contributing the technical knowledge necessary for policy-makers to regulate efficiently and effectively. In close cooperation with its members EVIA is expediting the upgrade from the Walkman and despite the barriers EVIA is moving forward with VHK and the University of Ghent with the development of an IAQ label.